Maria Montessori was renowned as the first woman doctor in Italy . Her work and insight with children revolutionized the world’s understanding of how young children learn. Dr Maria Montessori was born in Chiaravalle, in the province of Ancona, Italy, in 1870. She obtained her medical degree in 1896. It was then that Montessori’s journey toward developing what we know as the “Montessori Method” began. The core principles that define her method evolved through the time she spent simply observing children. She worked as the Director of a branch of the University of Rome known as an asylum for “deficient and insane” children and discovered that the children she was observing needed not medical attention but an educational system in which to thrive. 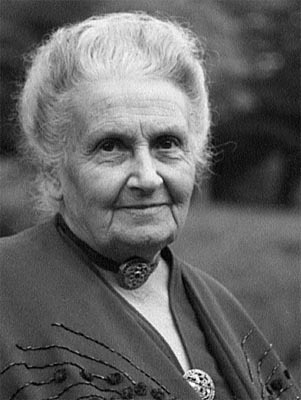 In 1896 Dr. Montessori expressed, “I felt that mental deficiency presented chiefly a pedagogical, rather than mainly a medical, problem.” After this revelation Montessori began to develop an educational structure that combined ideas of scholar Froebel, anthropologist Giuseooe Sergi, French physicians, Jean Itard and Edouard Seguin, with methods that she had found in medicine, education, and anthropology. She continued her work in a small school for challenged children in Rome and then in 1907, Montessori opened a child care for children in the slums of Rome that she called the Casa de Bambini (Children’s House). Here she combined years of study with day to day observations and formulated her educational method. This method continues to thrive, 101 years later, in Montessori schools all over the world. Maria Montessori believed that children are the bridge that can empower us and nurture society for the enlightenment of mankind. The classroom is a place to encourage children to learn about their own spiritual development and to practice peace. The classroom curriculum offers exercises in grace and courtesy that provide a basic framework for lessons in peace education. For example, the children are given lessons on how to properly interrupt a teacher or a friend. This and other lessons like it provide the children with ‘tools’ that allow them to respect the classroom, their peers, their teachers and themselves. In full circle each child learns to expect courtesy from others and most importantly, feels safe. Peace Education is a simple concept with the power to dig deep toward teaching children how to live harmoniously with others, within their environment and with the natural world. The materials in the Montessori classroom are offered to the children with a direct aim in mind. Each material isolates a concept and allows for repetitive practicewith a certain skill and for the most part is “self-correcting”. This means that their design allows the child to solve challenges inherent in the materials without help. For example the Knobbed Cylinder materials (long blocks of wood with cylindrical cut-outs graded in length and/or diameter from 1 to 10 centimeters) are self-correcting in that included are ten wooden cylinders each with only one choice for perfection in its match to a cut out in the block. Through experience and without the teacher’s direction, a child is able to gain an understanding of the concrete dimensions that give this work meaning. Through her years of observation Montessori discovered that there are certain times during a child’s development when he or she focuses on certain skills feverishly, sometime forgoing all others.Montessori labeled these times of intense focus Sensitive periods. Montessori observed many sensitive periods in young children pertaining to order, language, learning manners and refinement of the senses. For example it is much easier for a child to learn language or even two languages before the age of six. As an example take an adult trying to learn a new language, studying endlessly to grasp it. Then look at a child of two who can absorb the language as it washes over them. This is an example of a sensitive period, it comes naturally as opposed to being teacher directed. The absorbent mind exists for the child between the ages of 0-6. During this time period children soak up their environment by just existing in it. The child’s mind is open to all learning experiences because her brain, not fully formed, is open to all sensory input in a natural way . The classroom is prepared before a child enters the room and encourages a child to have freedom and independence by focusing on a child centered curriculum, as opposed to teacher directed curriculum. Each child has his or her own distinct pattern for learning. The classroom is set up in a way that enables each child to follow his or her own divergent path in harmony with and along side other children. Beginning lessons inherently focus on providing children with an independent experience that allows her to build on skills of concentration, coordination, independence, and order. The classroom is prepared in a way that children slowly gain independence as they practice each skill and gain knowledge (primarily about themselves and their environment.) It is with these skills that they build an understanding and ownership of their classroom which not only allows them an opportunity for independence, but encourages them to teach as well. The teacher’s role in the environment, above all, is to observe. She is watchful of the children, their needs, and the direction of the work that must be prepared. Her role is to also present lessons to individuals or small groups. She also sets the tone for the classroom by providing a framework in the beginning months of each school year. These ground rules establish a basic understanding of respect for the environment, the work in the environment, and above all, respect for fellow classmates.